Businesses who take advantage of mobile technology have more flexibility to adjust to market changes. Mobile technology—and the cloud-based services that enable it—has become one of the most revolutionary forces in modern business. But, for all its reputation as a disruptor in business, mobile technology has also helped businesses adapt. From streamlined communications to increased access to business services, mobile technology is opening new possibilities for business. However, not every business has been eager to access these services, and those that have adjusted to some of them may not have fully implemented their advantages. 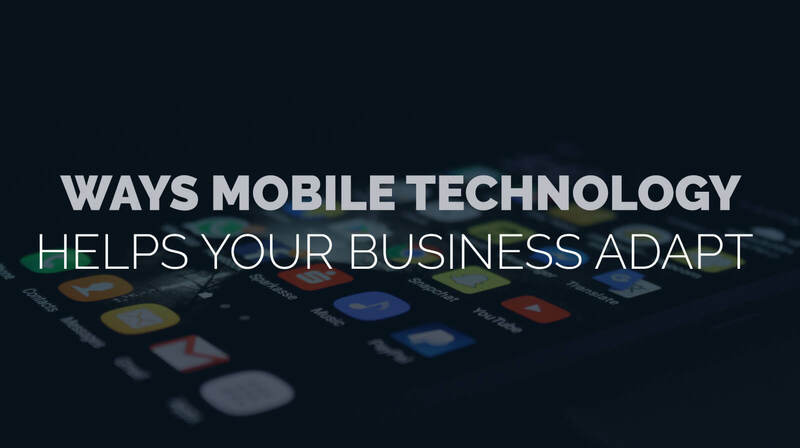 If you’re wondering what other ways you could gain a business edge by taking advantage of mobile technology, here’s where to start. 1. Mobile technology allows for faster scaling. Mobile technology often relies on cloud-based services to function efficiently. While users engage with one device, the data they use uploads directly to the cloud. This frees storage space on mobile devices, helping them run effectively. However, this reliance on cloud-based storage also makes it much easier for businesses to scale quickly. When information is stored in the cloud, growing storage can be as simple as upgrading a subscription plan—it doesn’t mean costly investment in hardware and infrastructure. And when those investments do happen, they require fewer local installations, because much of their data and services are cloud-based. 2. Remote work from home or on the road. The perception of remote work has changed radically over the past few decades. Initially, remote workers were those who worked from a home office and phoned in for meetings. These teleworkers kept their files on local storage, and had to remember to bring relevant data into work on thumb drives, just like other files. Laptops increased the mobility of employees, aided by prevalent and easy access to wireless Internet. Finally, smartphones added the final layer of connection, creating an even more portable way to check in on work and move projects along when necessary. As a result, workers can operate on more flexible time schedules that can offer a more accommodating work/life balance. Businesses who want to recruit top talent can reduce the number of days employees are required to come into an office, or offer work to highly-qualified employees from different parts of the country. They can even attract a digital nomad workforce, if that’s what is most appealing to their employees. 3. Remote desktop increases work flexibility. It’s an amazing thing to access your services anywhere from your laptop, but doing so still involves logging in to various cloud applications, some of which may not satisfy your purposes. Cloud applications do have their limits, and one of them is that they often have to run lighter software services with fewer features. By contrast, desktop apps offer a more robust feature set, without taking up browser tabs. A remote desktop combines these benefits by creating a private cloud environment for individual businesses. With an entire desktop in the cloud, employees can log off their work stations in the office, and log back in on their home computer to find all their files as they left them. And, of course, they can do the same with their laptop, too. In fact, a remote desktop hosted on a private cloud environment is the perfect solution for field workers who want access to their data in rugged working environments. With a remote desktop, and employee could drop their laptop into a river, and have their entire desktop running again on a new laptop within a few hours. Workforces are more distributed than ever. With teams working together from offices in different cities around the globe, keeping in contact with everyone when they’re running on varying time zones can be a major challenge. However, mobile communication apps, such as Slack, WhatsApp, and Google Hangouts, not to mention more heavy-duty conferencing services such as Join.Me and GoToMeeting, have helped teams stay in touch even from remote parts of the world. These communication tools keep businesses functioning at peak efficiency, while also improving the coordination between departments and teams. It’s not just the business’s own internal systems that benefit from mobile technology. The same systems that allow modern businesses to achieve more flexible solutions also provide new ways to access services. Where before a business might have had to rely on in-house technicians for all their IT projects, now they can transfer some of those responsibilities to remote IT professionals. Working with a remote Managed IT Livonia team gives them access to a wider range of specialized services, but without the overhead of employing each specialist separately. It also helps small-to-mid-sized businesses take advantage of 24/7 remote monitoring and maintenance, as well as other services they might have been hard-pressed to afford if they had to staff a full team themselves. Better mobile technology solutions emerge every day. One thing seems certain about the state of mobile technology: with the current rate of change, we can expect more innovations to emerge every year. Businesses should be aware of the latest options on the market so that they can decide when to be early adaptors. Mobile technology can help businesses stay flexible as the industry changes. While chasing after every emerging trend can quickly eat up capital funds, investing in the right cloud strategies can lower these costs in the long-term. If you would like to learn more about our private cloud services and how they can help your business, contact Managed IT Ann Arbor today.